College grad that likes pearl milk tea. My first word was "pizza." I've been into cartooning and character design for a while, and drawing stuff is so fun that I'll miss lunch sometimes (yeah right!). Enjoys playing KoF98, or at least attempting to talk about it. Aka Bison2Winquote, SnDFrosteyneko, Frostey, Eben, etc. We deal with a modern time where powers known as "super-talents" exist-- and it ain't just dual-identified spandex weirdos using them that's for sure. One page per week, assuming I keep schedule. 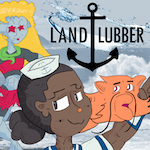 Shortly after graduating from high-school on her birthday, Enthè Navy discovers that she is related to a society of undersea people with a long history. She finds herself discovering many passions through this advent of additional identity. Co-written by DragonMage.